Get a real-life, cowboy experience on an overnight at the Grand Canyon Western Ranch, choosing between a horseback ride and campout, or a comfortable cabin stay with a Grand Canyon helicopter ride. 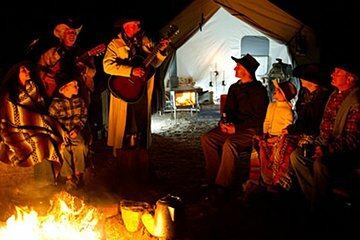 Whatever you opt for, you’ll enjoy an evening of Old West stories and cowboy songs by a blazing campfire, roast marshmallows under the stars, and enjoy included meals served western-style. Varies based on option selected. You will need to confirm this with the local operator prior to your travel date. Contact details will be provided on your pre-paid voucher. If your group includes children 9 or under, they will have to be escorted by a guardian via vehicle rather than ride the horses.